I recently had the good fortune to spend a few days with our friends who own a cattle farm in the Western Districts of Victoria, Australia. Here I was able to observe how they maintain their animals in optimum physical condition via a complex and proven routine of sustenance and “animal lifestyle” management. As I was watching and learning, it became apparent that many of the farming practices that were being used are applicable to business, particularly that of a Sales Manager looking after their key and strategic clients. For instance…. If there is a hole in the fence, clients will tend to leave the “paddock” and explore newer pastures. Clients need to be provided with information (“nourishment”) which when they consume makes them feel that they are growing via the supply relationship with your organization. 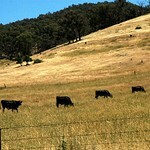 Cattle inside the paddock need to be continually moved from one location to another one, otherwise they deplete the grass and pollute the soil with excessive waste outputs. Similarly, clients need to be introduced to new experiences and information so they continue to see the perceived benefit. The farmer keeps a watchful lookout for any intruders that might harm the cattle. Sales Managers, need to keep a close eye on the competition. So next time you hear a “moo” from your clients, think about the above “farming practices” so your clients are kept in top-notch condition!